Over the years famous guitarists such as Eric Clapton, Jimi Hendrix, B.B. King, Carlos Santana and many others have made major contributions to the music industry. With those amazing moves and savvy performances, guitarists have taken the guitar’s reputation past the skies. A common custom or acoustic guitar looks pretty ordinary with its wooden body and nylon strings. But there have been some pretty revolutionary and unusual guitars as well that have really left a mark over time. Creativity is all about pushing the boundaries and come up with something extraordinary. How about knowing more about the top 10 most unusual guitars in the world? What are custom made guitars? True to its name “The Log” was basically well just a 4 x 4 log of wood with strings attached. Created originally by Les Paul, this “log” was later given a complete makeover when the guitarist added the traditional sides to the piece of wood, so that it looked more like the conventional guitar that we’re used to seeing now. Now back in those days this was a revolutionary step, and this addition by Les Paul is the perhaps the reason the audience sees the guitar the way it is. Adding the sides also improved the functionality of the instrument. Electric Guitar Company is Florida based company known for its super cool and sturdy guitars. Especially popular for their aluminium and acrylic guitars, this guitar manufacturing company was noticed by the famous pop icon Brent Hind of Mastodon. Together he and the Electric Guitar Company created a personalised model that was inspired by Gibson’s Flying V. The revolutionary design and super cool features were an absolute rage among guitar lovers. This guitar is all about flashy metallic look and innovative design with its solid acrylic body and aluminium finger board. What happens when the famous guitarist Gibson teams up with Five Finger Death Punch’s guitarist Jason Hook to design a personalised guitar? A masterpiece! Well the M-4 Sherman Explorer is a timeless classic among guitar enthusiasts. Jason Hook, inspired by his favourite music icon Gibson had introduced his own version of Explorer guitars that was a rage among his fans. It featured a Seymour Duncan ’59 and JB pickup along with Grover mini turners and a stylish cutaway body and upper body arm handle to add on to the charm. The famous guitarist Dean Michelangelo known for his exceptional shredding techniques has made a firm impression in the music industry. And his famous Armorflame Quad Guitar, though pretty bizarre to look at with four heads and necks, helped Michelangelo in his shredding and facilitated faster and more accurate tuning and playing. This guitar was custom made for Dean Michelangelo and his over the top guitar playing techniques. The Armorflame can be dismantled into four separate guitars and is pretty practical and useful on stage. This is the kind of guitar you’ll find a rock star jamming on to in a punk rock concert. A partnership of sorts between Jackson Guitar Company and the famous master builder Pablo Santana, the Extreme Zodiac Series has been designed by the well-known graphic artist Craig Fraser. True to its name the Zodiac series features one zodiac sign in each of its guitars in the collection; add to that Jackson’s classic Kelly edged structure and Warrior body and you’ve got a masterpiece! These limited editions guitars perfectly compliment the Santana jagged and rough style and are available for $7,400. Everything about “The Villainizer”, from the body to the design screams out punk! A one of a kind custom made guitar created by Rhodes Jackson V it is a rugged and wild instrument reminiscent of the old Wild West. The jagged framework complete with gauges, gears, pipes, weld and rust add on to the retro charm. Just the kind of thing you can expect in a rock or heavy metal concert! But sadly this is a limited edition and not up for sale, although you can get one made for yourself if you have a thousand dollars to spare! The super awesome features and added appeal make The Villianizer an absolute rage among guitar enthusiasts. Paul Gilbert is a renowned musician and performer known for his killer shredder moves and stage presence, a happy go lucky person, he has quite an impressive fan following in the music community. His famous guitar the Ibanez Guitar, a classic piece with a unique Iceman shaped upside down design. Replete with many super cool features such as three Dimarzio Area ’67 single coils, a very vintage 70’s era tailpiece, sturdy Korina body, a wide set neck and a sturdy Gibraltar II bridge and Bubgina fingerboard, this is one swoon worthy guitar model! Perhaps one of the most innovative and unusual pieces ever in the music world, Misa Kitara has some very interesting features and a revolutionary design. 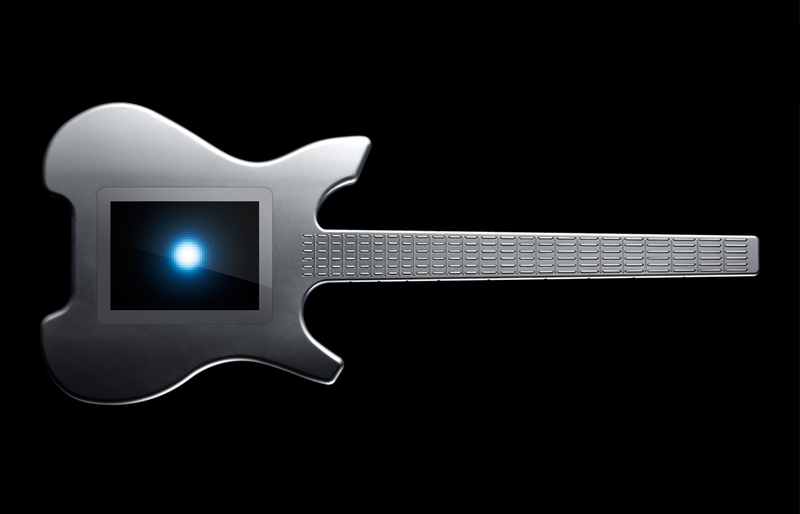 This musical instrument has a touch screen interface and the embedded surface displays six virtual strings; virtual because they are attuned to the guitarist’s finger movements. Highly sensitive, this guitar is based on a futuristic and innovative technology that could sense the fret movements on the side of the instrument and play accordingly. How cool is that! It allows the guitarist a more diverse range of sounds and tunes than any other guitar out there. The many amazing features of this instrument have caught the attention of famous musicians such as Matt Bellamy and have been featured with the popular band Rolling Stones as well! The Ibanez TAM100 is what you get when you combine the genius of the popular lead guitarist and fret board master Tosin Abasi of the renowned band Animals as Leaders and Ibanez, a known guitar making company. This custom made personalised model is not up for sale and is a one of a kind instrument replete with super awesome features. The innovative design, light framework and comfortable fret board only enhance its functionality. 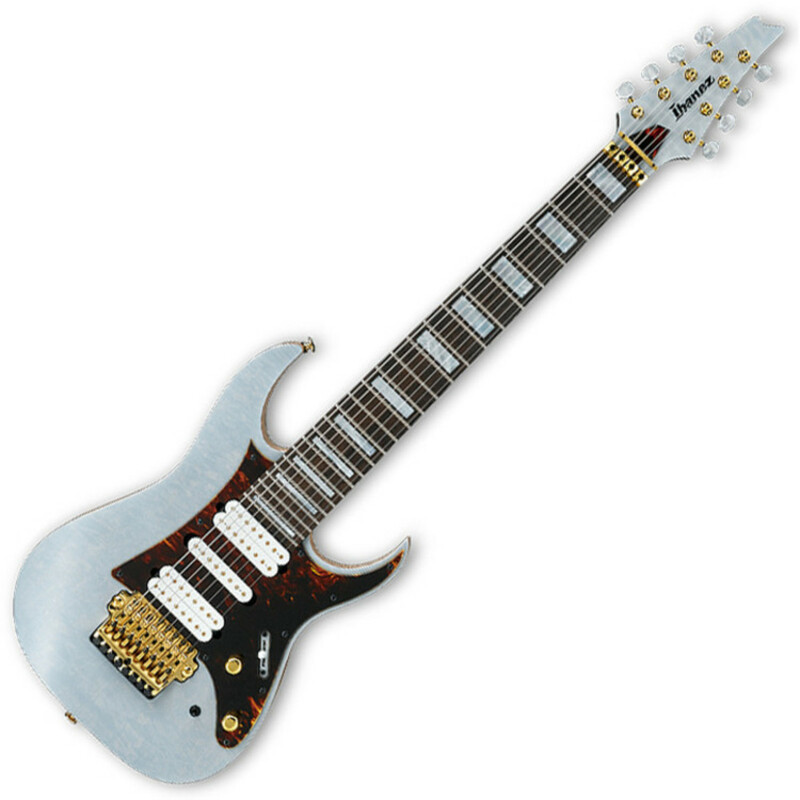 An eight stringed instrument, this guitar is inspired by another of Ibanez’s classic creation, RG model but with some improvements. The sturdy body made from Basswood is decorated with a bluish grey coloured Maple top, while the long neck is made from Wenge and Bubinga with Titaium truss rods for extra appeal. Although most of these guitar models were considered bizarre and weird in their times, their true value was realised only years later. Way ahead of their times, these futuristic and revolutionary models have changed the very foundation of the music industry. Whether you’re going solo or playing in a band, the guitar is indispensable part of your music. Creativity and innovation is a crucial step for improvement. And while ordinary acoustic guitars have retained their charm, these custom made guitars have the extra appeal, the X factor that makes them so cool and desirable! Great Article!! What a fantastic Guitar. Thanks for sharing.